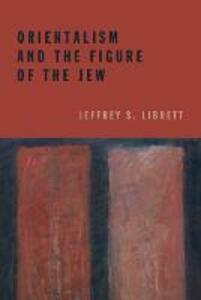 Orientalism and the Figure of the Jew proposes a new way of understanding modern Orientalism. Tracing a path of modern Orientalist thought in German across crucial writings from the late eighteenth to the mid-twentieth centuries, Librett argues that Orientalism and anti-Judaism are inextricably entangled. Librett suggests, further, that the Western assertion of "material" power, in terms of which Orientalism is often read, is overdetermined by a "spiritual" weakness: an anxiety about the absence of absolute foundations and values that coincides with Western modernity itself. The modern West, he shows, posits an Oriental origin as a fetish to fill the absent place of lacking foundations. This fetish is appropriated as Western through a quasi-secularized application of Christian typology. Further, the Western appropriation of the "good" Orient always leaves behind the remainder of the "bad," inassimilable Orient. The book traces variations on this theme through historicist and idealist texts of the nineteenth century and then shows how high modernists like Buber, Kafka, Mann, and Freud place this historicist narrative in question. The book concludes with the outlines of a cultural historiography that would distance itself from the metaphysics of historicism, confronting instead its underlying anxieties.